There is a high demand for well-qualified and effective mathematics teachers in our nation’s middle and high schools. For those with a deep understanding of mathematics and a call to teach, we offer a program that prepares you to become a math teacher and to ignite and support the learning of all students. The courses and field experiences will help you develop the skills, knowledge, and habits of mind necessary to being an effective, dynamic teacher of mathematics. 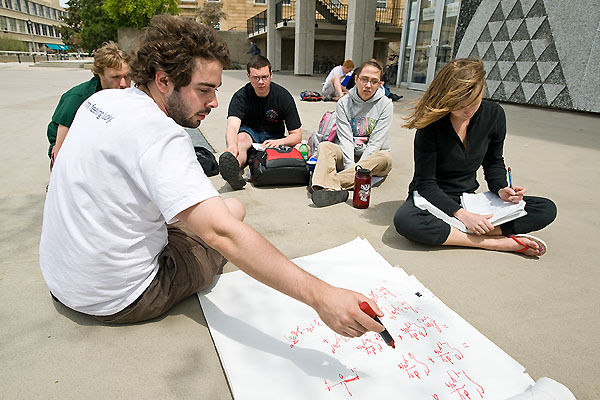 If you have questions about the field of secondary math education, or about the mathematical thinking preparation within the program, please feel free to reach out to the SED Math Coordinator, Jen Murphy, at kuehl1@wisc.edu. Students may be able to complete a national math content exam to address certain gaps in their coursework. The Praxis II: Subject Assessments/Specialty Area Tests through the Educational Testing Service (ETS)—General Mathematics Exam # 5161, is the exam most often used. A passing score for this exam is 160. This test may be taken after you have been admitted into the program. If you believe you have a special case for consideration, including significant professional experience, or comparable university courses, you may send an email to Jen Murphy explaining your situation.